Four rods of equal lengths are hinged at their endpoints to form a rhombus ABCD. Keeping AB fixed, CD is free to move in the plane with the angle BAD between 0 and 180 degrees. 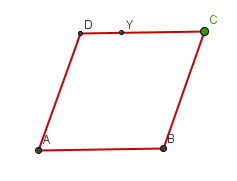 What is the locus (or path) of the point D? Investigations. Creating and manipulating expressions and formulae. Loci. Small software. Cartesian equations of circles. Regular polygons and circles. Circle properties and circle theorems. Pythagoras' theorem. Sine, cosine, tangent. 2D shapes and their properties.